“I Forgot To Remember” & “Mystery Train” being played on KPEP over and over, day after day, month after month on my AM car radio while driving around in my 1955 blue & white Olds 88 (I really couldn’t afford this car). When we would go down to Christoval Park on the river they had this outside juke box in which it continued to blast “Blue Moon Of Kentucky” “That’s All Right” & “Baby, Let’s Play House” late into the night. When it came to Elvis in 1955 it was Scotty Moore’s guitar work that got my attention”. Reminiscing: “When Elvis, Scotty & Bill came to San Angelo on a Wednesday January 5th 1955 they were driving a 1951 brown Lincoln. At this point in time Scotty was Elvis’ personal manager and had borrowed the car from Jim Ed Brown’s dad for this particular West Texas tour. In 1955 Elvis, Scotty & Bill crisscrossed the south and southwest performing over 230 times doing mostly one-nighters. After getting a record on the Billboard Country Charts and doing some extensive touring Elvis went from a shy low-profile guy to a guy with more polish and far more sure of himself. According to Scotty he and Bill felt Elvis would be big but the bigness came way faster than expected. Elvis topped the bill this night at the SA Municipal Auditorium with Billy Walker, Jimmy & Johnny along with Peach Seed Jones (Tillman Franks) completing the lineup. After the concert hundreds of teen girls rushed the stage for autographs in the SA Municipal Auditorium which has a capacity of 1800. Reminiscing: “I think it was February 17th 1955 when Ronny Pollard and I saw Elvis, Scotty & Bill at the San Angelo Auditorium. There were two shows one at 7:30 and one at 9:30 PM. The auditorium was full with mostly teen girls. Ronny and I laughed at seeing the girl’s reaction to Elvis. After the show I got to sit on the hood of his 1955 pink Cadillac as he signed autographs by the car. In 2009 Rosie and I got to see this same Elvis’ 55’ pink Caddy at Graceland. By the way we drove to the Elvis show in my 1949 Ford and the very first record ever purchased by me was “Hound Dog” in 1956”. 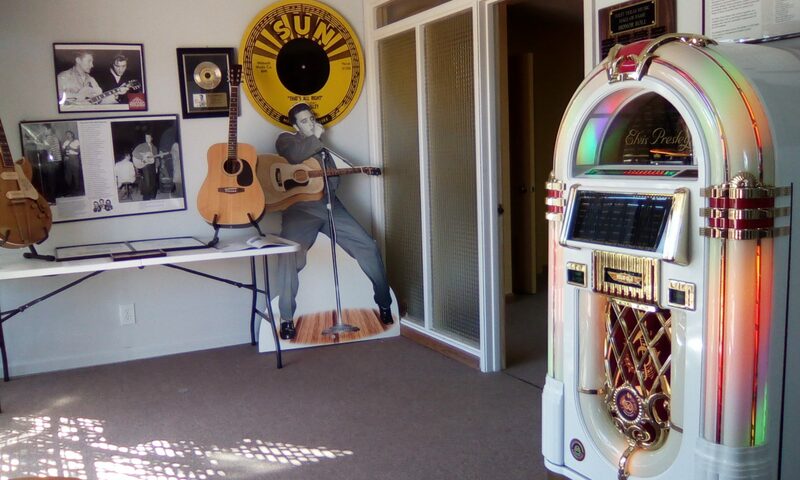 Reminiscing: “In 1954, after hearing Elvis, Scotty & Bill on KPEP Radio in San Angelo Alton Baird (vocalist/guitar) and I (guitar) began trying to learn their recordings on Sun Records. On January 5th 1955 I was lucky to be able to purchase a ticket for the show in San Angelo. After the show I made it a point to go to the back of the building where the bands load and unload their equipment. It was here I got the chance to meet Scotty Moore & Bill Black. After some small talk they ask me where the action was in San Angelo in which I told them they could ride with me taking them to a large popular Country and Western club called The Hanger located on the west side of town. I learned later that night that Elvis had gone to the Circus Club a teen hangout nearby”. Spotlight On Talent (Billboard Review August 7, 1954) That’s All Right b/w Blue Moon Of Kentucky: Presley is a potent new chanter who can sock over a tune for either the Country or R&B markets. On this new disc he comes thru with solid performances on both sides. A strong new talent. Reminiscing: “It’s amazing to look back and see how accommodating the Midland School Administration was concerning such events. It was crazy seeing how girls reacted to Elvis as friends of mine just went crazy when he appeared on stage”. Reminiscing: It was at the Cotton Club January 6th 1955 when Waylon recalls meeting Elvis. “He was about the hottest thing to hit West Texas. They didn’t know what to call his music yet on the radio but they thought of him as a country artist. Elvis just may have been the most beautiful man in the world. His face was carved like a stone, chiseled out of rock, he was just that good looking”. On April 29th Elvis, Scotty & Bill return to the Cotton Club in Lubbock. The Cotton Club had the reputation of being color blind to race, color and types of music having booked artist such as Little Richard and Willie Nelson. Some of the earliest film footage of Elvis was shot this night by Ben Hall. Even in the early days Elvis almost always stole the show from the headliners. Nobody wanted to follow Elvis Presley. Elvis created a whole lot of commotion wherever he went with girls screaming, fainting and chasing him. “When I saw Elvis in Odessa in 1955 for the first time his energy was incredible, his instinct was amazing and I didn’t know what to make of it”? When Elvis played in Odessa January 7th 1955 he visited a local record shop in the afternoon in which a couple of teen girls assisted him in signing autographs (forging his name on a large stack) for the evening show. The autographed photos were then sold at intermission for 25 cents each. An 8×10 autographed promo photo of Elvis (or one of the gals above) on today’s market, from 1955, would sell for $500.00 and up. On June 3rd after seeing Elvis perform at the Pontiac car-dealership Show in Lubbock Mac Davis describes himself as being “flabbergasted”? Elvis would later record million-selling songs written by Davis. Glenn D. Harden also attended this show and would later be part of Elvis’ TCB band in the 70’s. The Sun Sessions (songs from 1954-55) album is ranked #11 on Rolling Stones Magazine’s list of The Greatest 500 Albums of All Time. It was re-released in 1972 reaching #2 on The Country LP Charts RIAA Certified Gold. Feb 13th (after playing in Alpine and in Carsbad, NM) Elvis, Scotty & Bill are back in Lubbock and this time for a 4PM matinee at the Fair Park Coliseum with the group receiving $350.00. A young Buddy Holly appears at the bottom of this bill with Bob Montgomery (billed as Buddy & Bob Country & Western duo). “Elvis, Scotty & Bill set the standards for early West Texas Rockabilly bands in the 50’s. When Elvis added a drummer the rest of the groups would soon follow”. “Elvis & I were part of an extended package tour in 1955. We dated some taking-in movies in different towns. After the performances we’d go places with the band along with my father, of course. Anywhere that 1955 pink Caddie went, with the bass strapped on top, the whole town was there”. “He was an instinctive actor, quite bright and intelligent. He was not a punk but very elegant, sedate, refined and sophisticated” -Walter Matthau.